If you are reading this (hi mom), you and I probably share the same affinity for caves and the entire karst landform. Some of you know me personally yet others do not. To that end, let me use this blog post to share a little about myself. I have been exploring all of my life (thanks mom) and diving for over 25 years, I grew up diving golf course lakes for golf balls and the black rivers of the South Carolina low country in hopes of treasure or anything historic. I served in the US Navy where I became a true diver and worked as a ship’s diver (submarines) and as an underwater husbandry diver (submarine tender). After moving to Florida and a break from diving; my interests soon returned to diving and I started focusing on technical diving. This eventually led me to the beauty of Florida’s caves and caverns as a cave diver. and long lost brother Robert Brooks. The combination of both disciplines, caving and cave diving, have provided me a unique perspective and appreciation for all that is karst. My passion for caves extended to dry caves, fully developing my perspective of the entire karst landform that we all appreciate as cave explorers. The combination of both disciplines, caving and cave diving, has provided me a unique perspective and appreciation of caves. I share my passion for caves and conservation by hosting vertical clinics, leading dry cave trips, and speaking at events for the NSS Cave Diving Section (CDS) and the National Association of Cave Diving. 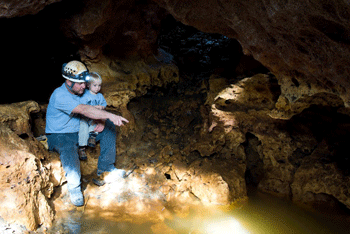 Presently, I am active in three major areas of conservation and exploration of both dry and wet caves. In Florida, I serve as an explorer and the dive safety officer for the Weeki Wachee Springs Exploration Project; Weeki Wachee is currently the deepest naturally formed spring in the U.S. In the Dominican Republic, I discovered significant primate fossils that changed the direction of how New World primates are studied. In Mexico and the U.S., I am an explorer and logistics director for various ADM Exploration Team expeditions. I am very blessed as a person and have had the great fortune to a member of The Explorers Club, a board of director (BOD) member of the ADM Exploration Foundation and previously work with the BOD of the The Karst Conservancy and Karst Underwater Research. I have also served as the National Association for Cave Diving (NACD) Public Relations committee chairman and Election Administrator for the NSS-CDS. Above all, I am the father of an amazing son and an EXPLORER! If anyone ever has a question about exploration, wants to learn how to climb or simply wants to go stomp around in the swamp, don't hesitate to contact me.